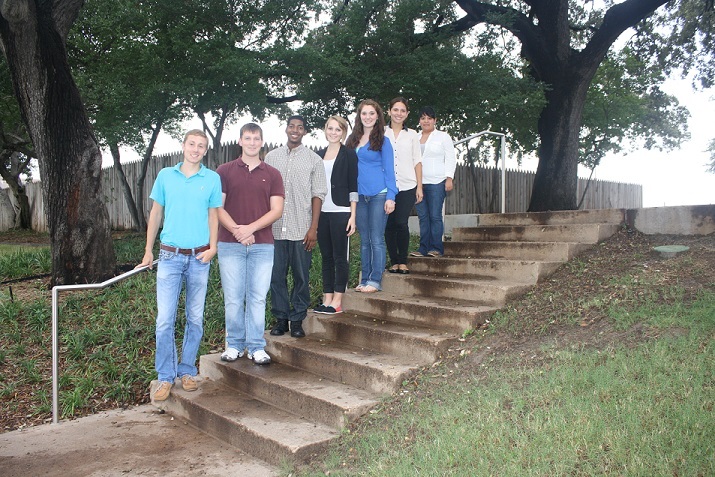 Saturday was the L.E.A.P students second day in Dallas. Each of us was up before sunrise to get ready for the central focus of our trip to Dallas, The New Politics Forum Careers in Politics at Southern Methodist University. 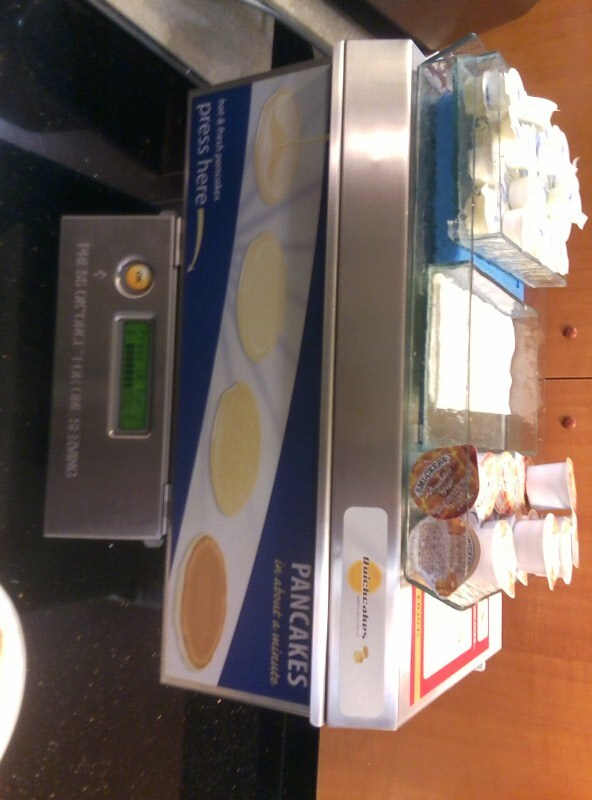 We began by enjoying a complementary breakfast in the hotel lobby which included cinnamon rolls, cereal, fruit and even a pancake making machine! We arrived at the SMU campus at 8:30 a.m. and began mingling with other program participants during the breakfast social. The program consisted of several prominent speakers that would give advice to students about political and public service involvement as well as share their personal stories. The first panel of speakers included Texas Representative Rafael Anchia, Texas Representative Kennith Sheets and Chancellor Lee Jackson. These distinguished public officials shared their stories of success along with their occasional frustrations working in government. Chancellor Jackson described his aversion to social media while Representatives Anchia and Sheets spoke of their succeess with social media in campaigning and re-election. When asked what each of their frustrations with policy making were, Representatives Anchia and Sheets bemoaned fundraising. However, Chancellor Jackson had a very different view. Chancellor Jackson, however, described some of the things he’d like to see enacted (e.g., professional salaries, annual sessions) as some of his biggest challenges. 1. Try to work through the problem and work through it the best you can. 2. You can’t serve yourself and the public at the same time. 3. Listen and work with people ragardless of their political affiliation. 4. Most issues are geographical issues, not partisan issues. He really strived to convey the message that being a public servant was not an easy path and has no room for self-interested thinking. Next, a panel of media experts spoke about their experiences working within the political realm. The guest speakers were Carol Reed, President of The Reeds PRC and Gromer Jeffers, political reporter for the Dallas Morning News. Carol Reed worked on Senator John Tower’s campaign in 1976. She has also spearheaded “landmark” projects with American Airlines. Gromer Jeffers is originally from Chicago and he worked his way up the journalism ladder in Dallas, Texas. One of his first tasks as a political reporter was to cover Barack Obama’s presidency campaign. After the media experts panel adjourned, the SMU alumni’s panel convened. The students included Warren Seay, President of DeSoto ISD Board of Trustees, Kristina Kiik, U.S. District Judge Royal, David de la Fuente, former President of Dallas County Young Democrats, and Jonathan Boos, President of Dallas County Young Republicans. The alumni discussed their experiences in the political world, both good and bad. They also shared a unanimous view that the best way for current college students to get involved in politics was to work on a campaign that we were passionate about. After the Careers in Politics Conference, we enjoyed a lovely dinner at Eatzi’s. Eatzi’s has a wide variety of foods ranging from brisket tacos to chicken curry. The brisket tacos were delicious; however, they don’t compare to the brisket tacos at Farmhouse Sweets and Eats in Huntsville, Texas. Many of us became adventurous and tried new foods such as hummus, chicken curry and shrimp salad. After dinner, we ventured over to Paciugo Gelato Cafe for desert. There were so many flavors to choose from; however I chose peanut butter chocolate swirl. The gelato was unlike Blue Bell ice cream in so many ways! Gelato is much thicker, creamer and sweeter! We concluded our night with two short pit stops. The first being Dallas City Hall. City Hall was built by I. M. Pei for 70 million dollars in the 1970s. It is an intriguing design, and made for a peaceful stop after a long day. The building was constructed to allay the Texas heat, while also providing an intriguing design and a new image for a City known, at that time, as the home of Lee Harvey Oswald. The second pit stop was the Dallas Pioneer Plaza Cattle Drive. The many statues of cattle depict authentic cattle drives in the south. There were seventy bronze statues of longhorns running through the park along with three bronze statues of cattle wranglers driving the herd. There are also beautiful water features throughout the Cattle Drive that help to add to the authenticity of the art. In conclusion, today was a very memorable day! We learned a lot about politics from officials and experts that have been in the industry for quite a while. 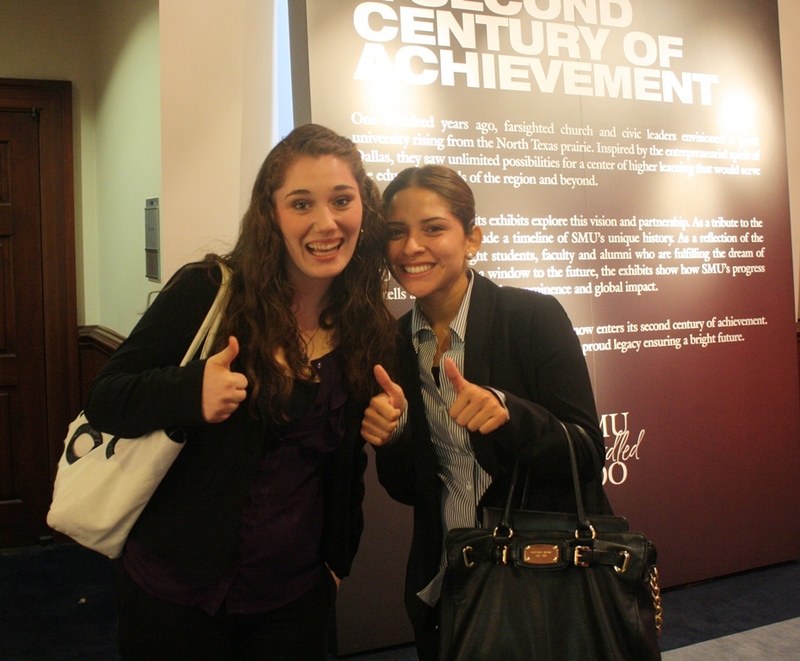 We were also able to expand our cultural knowledge and appreciation for Dallas, Texas! I, and other students involved in the L.E.A.P program, set off on our adventure to Dallas around noon this Friday afternoon, stopping along the way to visit the esteemed Woodbine Hotel for lunch, which is known for making delicious meals slathered in mushrooms. I ordered the alfredo pasta with vegetables, and it was delightful. The mushrooms were all that they had been hyped to be. We set off again after lunch, full and anxious to continue on to Dallas. 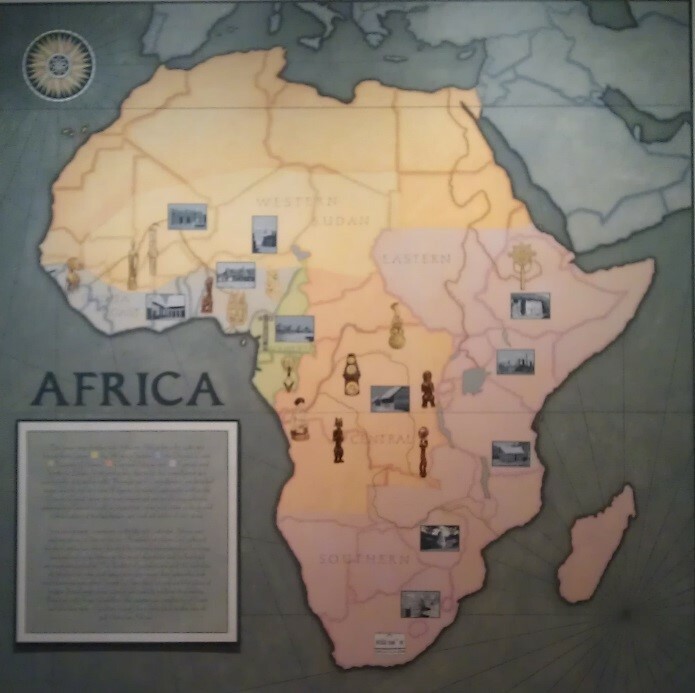 The Museum also had an African map, designating the location the artifacts were collected. Today was day one of our journey to Dallas for the New Politics Forum Careers in Politics Seminar at Southern Methodist University (SMU). As we had several stops on our itinerary, we departed SHSU at 12:00pm for Madisonville, where we would have lunch at the Woodbine Hotel. The Woodbine Hotel, located in the heart of Madisonville, offers local specialties on its lunch menu. The atmosphere of the Woodbine was very inviting and warm and the food was delicious. The table was neatly set and there were cookies awaiting us as well. Several of the dishes showcased mushrooms since Madisonville is known for their mushroom farms and annual mushroom festival. Departing The Woodbine, we set out for the Sixth Floor Museum in Dallas, Texas. The drive was rocky due to thunderstorms; however, we managed to arrive safely. We embarked on our tour of the wonderful life and struggles of President John F. Kennedy. The Museum was set up to follow John F. Kennedy’s presidency chronologically. The tour started with his background and his family, then quickly moved to focus on issues that President Kennedy faced during his term, such as the Cuban Missile Crisis and the Civil Rights Movement. 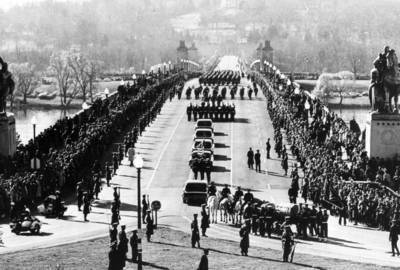 The majority of the tour, however, focused on President Kennedy’s assassination. The exhibits were very detailed, with examples and models that explained how and where the assassination took place. There were several videos throughout the exhibit that went into further detail about his presidency and the aftermath of the assassination. The seventh floor of the Museum held a presidential photograph display. There were multiple candid photos of presidents throughout their presidencies. My favorite was of President Barack Obama enjoying a taco at a small diner while talking to the citizens in the diner! We then ventured out to Dealy Plaza, President Kennedy’s assassination site. 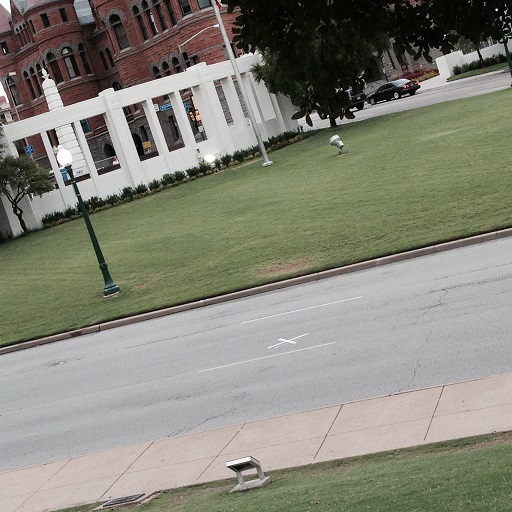 We were able to view the “x” marks on the road marking the exact spot where President Kennedy was shot both times. The Museum was a very enlightening experience that really opened my eyes to the complexity of the Kennedy Presidency. Next, we arrived at The Spaghetti Warehouse for dinner. The atmosphere was comparable to an old circus with a train car in the middle of the dining room in which customers could sit and eat. Fortune telling machines and bright colors decorated the interior of the restaurant’s entryway. My meal, and dessert, was very delicious, and the portions were enormous! Last, we made an impromptu stop at the Dallas Museum of Art. 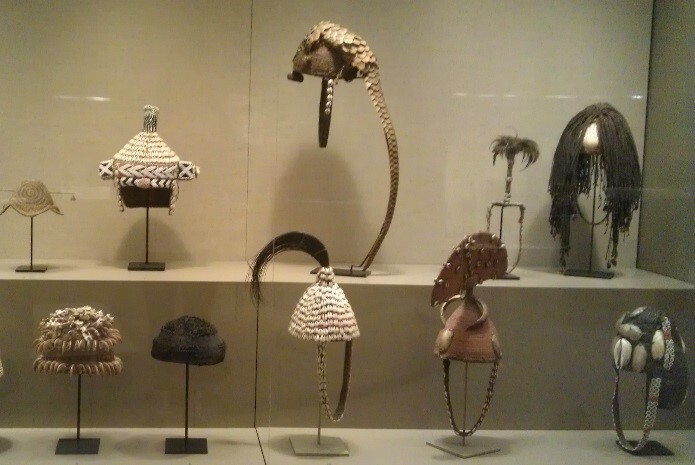 We toured the different levels of the museum, each focusing on a different type of art, ranging from African art to Picasso. 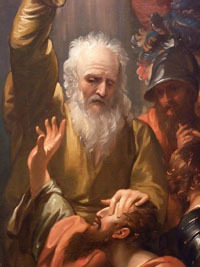 My favorite painting was “Conversion of St. Paul” by Benjamin West. This painting explained the journey of St. Paul and was both moving and provocative. I can’t wait for day two of our wonderful adventure! Today, six other SHSU students and I left Huntsville for a weekend in Dallas. Our first stop upon arriving was the JFK Sixth Floor Museum. Fifty years ago history was changed from this very building that has been preserved to honor the memory of President John F. Kennedy. The Museum features insightful films and photographs that explore the legacy of Kennedy’s life, from his marriage to Jackie O to the many conspiracies surrounding his death. As part of the tour, we made our way to the seventh floor of the Museum to see featured photographs of presidents throughout the last 100 years. 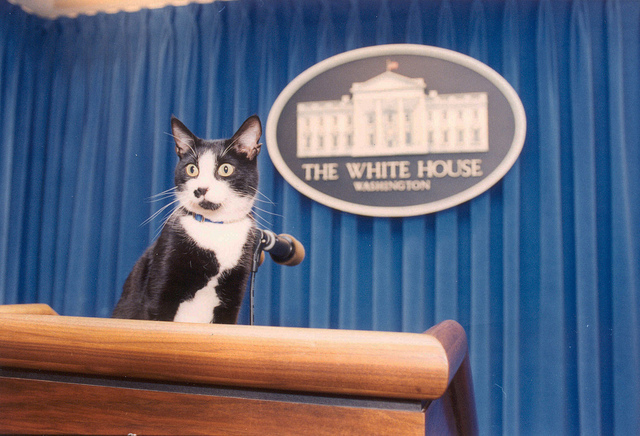 The saying “a picture is worth a thousand words” holds true for this exhibit as the photographs range from the iconic black and white head shot of Abraham Lincoln to silly photographs of “Socks at the Podium” in which President Clinton’s family pet stands on the Press Podium of the White House. Before leaving the Sixth Floor Museum we walked along Elm Street — the same street down which JFK was driven, waving to supporters, as he was killed. Our trip to the Sixth Floor Museum was a success, as we all enjoyed the exhibits while learning about history. A few blocks away we enjoyed dinner at The Spaghetti Warehouse, where most enjoyed traditional Italian cuisine while a couple of more spontaneous travelers went for the Kung Pao Chicken Pasta and calamari. No matter the dish, it was a great dinner with great company. To top off the night we ventured a few more blocks to the Dallas Museum of Art, which is home to amazing pieces of art reflecting many cultures and time periods of human existence. 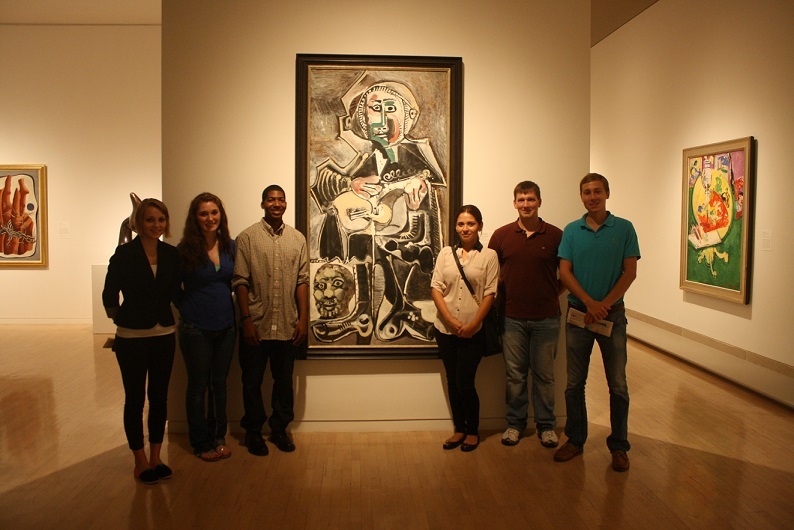 Our group was able to snap a shot next to Pablo Picasso’s “The Guitarist” painted in 1965. 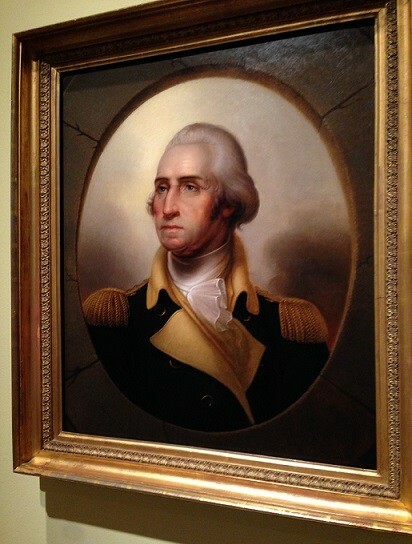 Perhaps a more deep-rooted and archaic painting, one of my favorite’s was Rembrandt Peale’s portrait of George Washington (dated 1824). In sum, I had a great time getting to know the members of my group and experiencing this day with them. 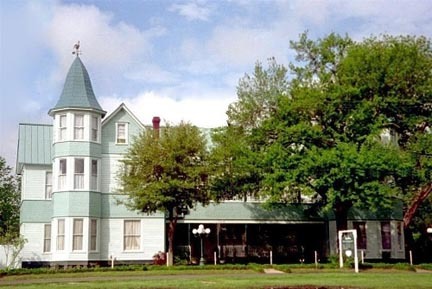 We stated off our day with lunch at the Woodbine Hotel located in Madisonville, Texas. The Woodbine is the oldest building in Madison County. As you enter, your eyes are immediately drawn to the hand-made quilts in the main lobby of the hotel; some of which were made by the local residents of Madisonville. The Woodbine is best known for using fresh locally grown mushrooms in many of their entrées. One of my personal favorites is the East Texas Lunch Plate; it consists of grilled chicken topped with a mushroom sauce and served with a side of sautéed vegetables. I recommend it to everyone. Once we arrived in Dallas, our first stop was the 6th Floor Museum. 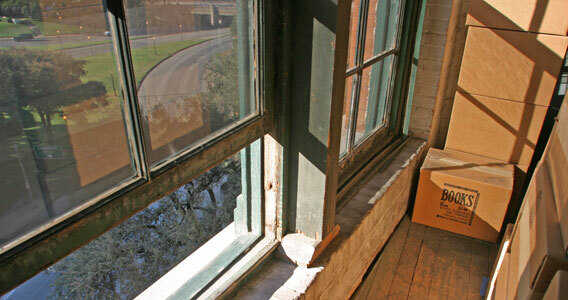 It is the notorious site where Lee Harvey Oswald shot and killed President John F. Kennedy on November 22, 1963. We could not have chosen a better time to visit this historic site, which is nearing the 50th anniversary of the tragic shooting that ended JFK’s life. The museum creates an atmosphere that takes you back in time to the events before and after the assassination. The combination of the visual displays as well as the audio devices provided, helped me visualize and have a better understanding of the type presidency that Kennedy had. Classroom learning can only show you so much, actually looking down onto Elm St. where the two x’s mark the spot where the bullets struck Kennedy gives you a better appreciation history. For dinner, we decided to eat at the Spaghetti Warehouse in downtown Dallas. Its cuisine is classic Italian pasta. The restaurant presents a lively, comfortable feel complete with a wonderful staff. The warm environment helped to facilitate conversation between the students, who did not know each other yet. By recommendation of our waitress, I decided upon the Four-Cheese Manicotti, something I’ve never tried before. Big pasta tubes are stuffed with Italian cheese covered with a blend of fresh tomato sauce and Alfredo sauce. The tangy tomato sauce and the creamy rich Alfredo was a surprisingly nice combination that complemented each other well; I do not regret my choice at all. 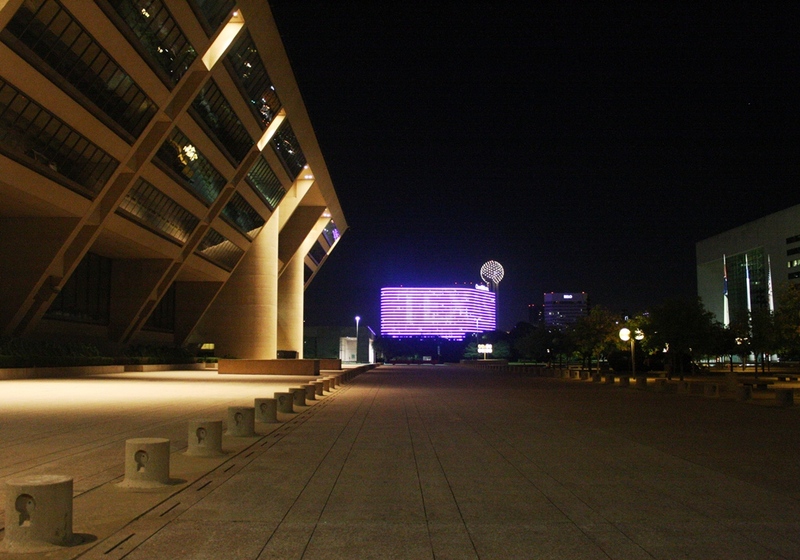 As a nice unexpected surprise, the Dallas Museum of Art was having “Late Nights,” which is an event on the 3rd Friday of each month. It offers various tours, performances, activities, and reading throughout the night, free of charge. We decide to take advantage of this opportunity and explore the museum. One of my favorite exhibits was the artwork by Piet Mondrian. The exhibit showcases the transformation Mondrian made from being a post-impressionist landscape painter to an austere abstract artist. It was impressive to see the various stages of his art. 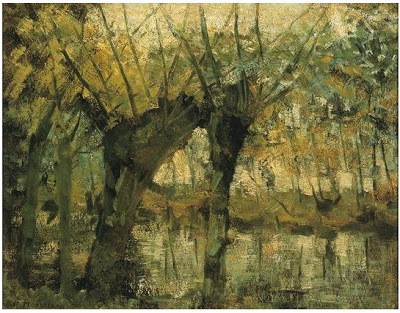 His early work consisted of paintings of the Dutch countryside; he uses different shades of greens and browns to depict nature. Later in his career, his art presented abstract bright colors that pop out to the modern viewer. Another fun aspect the museum has to offer is “Late Night Creations”, which allows the public to create their own form of expression through art. I chose to participate the Line Work with Amie Adelman. 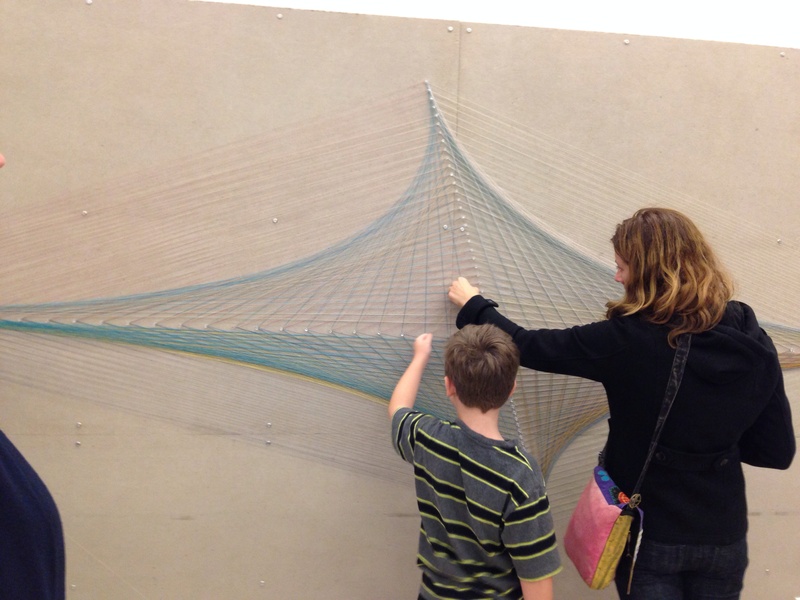 This consisted of art with straight lines to create an illusion of 3-D art. I helped in assembling a group art display as well as started my own. The staff and volunteers engaged to public to add their own special touch to the wall. It was exciting to see the art come to live before your own eyes. Collaborating with strangers to work on a common goal was probably the highlight to my day. Today our group left Huntsville for the New Politics Forum “Careers in Politics” Seminar—making stops at interesting and historic stops along the way. Our first such stop involved an enjoyable lunch at Madisonville’s Woodbine Hotel, where I had the day’s special, grilled chicken smothered in a mushroom sauce with broccoli and two small baked potatoes. It was a wonderful meal, and a wonderful start to our trip. The trip from Madisonville to Dallas was marked by a torrential downpour and a few traffic delays, but we were eventually able to make it to the Sixth Floor Museum in Dallas, Texas. 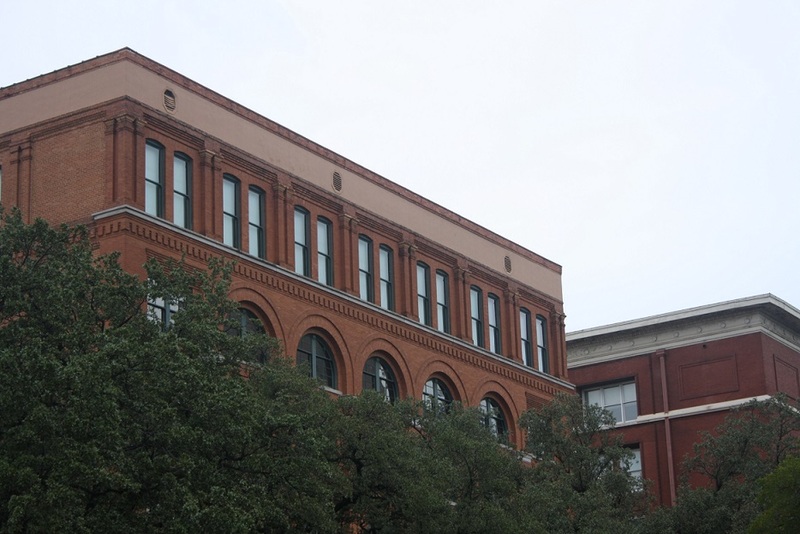 The museum is set in the former Texas School Book Depository in downtown Dallas and is the site of one of the most famous assassinations in U.S. history: that of John F. Kennedy. The museum chronicled JFK’s presidency leading up to that fatal day in November. We were able to see hundreds of Kennedy-era artifacts, which were complemented by numerous audio and visual clips. I was surprised at how divided the country was at the time, and it kind of reminded me today’s political climate. After finishing our tour of the museum, we went outside to look on Dealey Plaza to see the exact assassination spot. We strolled along the infamous “Grassy Knoll” and envisioned what it was like to be in Dallas, Texas on November 22, 1963. We hoped to dine at Ellen’s Southern Cooking (where “Grits Rule!”), but they were closed for a private party. Instead, we went to The Spaghetti Warehouse, where I had the signature spaghetti and meatballs and, for dessert, tiramisu. Not bad for a back-up choice. 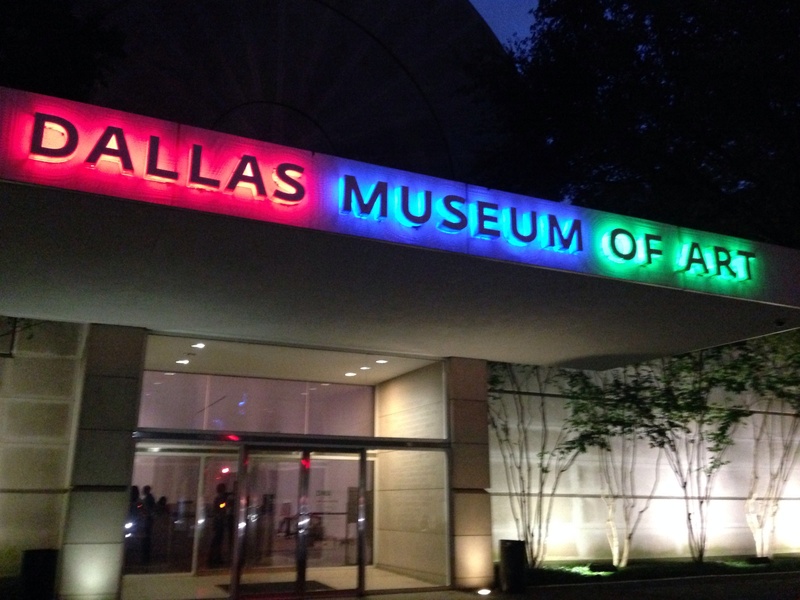 As a nightcap, we made our way to the Dallas Museum of Arts, where we toured art galleries ranging from Ancient Greece and Rome to modern art from Europe and America. 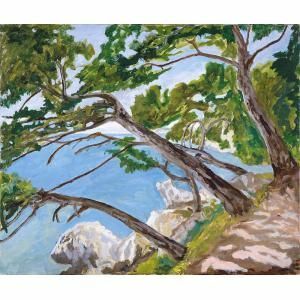 I most enjoyed the special exhibits featuring furniture and art works by Wendy and Emery Reves, who owned works by Renoir, Van Gogh, and many artifacts (and some paintings) by Winston Churchill. With that touch of politics, we set out to prepare for tomorrow, when we learn about careers in politics. As a May 2014 graduate, I’m hoping to learn a lot. On September 20th, 2013, seven students (including myself) from Sam Houston State University’s L.E.A.P. (Law, Engagement, and Politics) Program departed from Huntsville, Texas en route to Dallas, Texas for the New Politics Forum Event, which takes place on Saturday, September 21st. This event is geared toward college undergraduates and graduates, who are interested in a future career within the field of politics. Despite the windy, rainy weather during our travel, we successfully managed to stop for lunch at the Woodbine Hotel / Restaurant in Madisonville, Texas. Madisonville, as some of you know, is the mushroom capital of Texas, so it wasn’t surprising that many of the fine entrees came with mushrooms. The lunch also offered the chance for us to know one another. We had an International Business major, a Criminal Justice major, and, of course, Political Science majors, but we were all united in our desire to be engaged in civics. The Woodbine also offered us a chance to see interesting antiques, the most interesting of which was an antique phone booth. 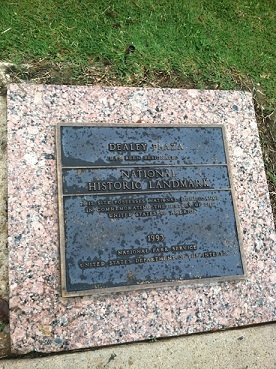 Continuing through the rough weather and mild traffic, the students arrived in Dallas, Texas around 4:30pm and went to the Sixth Floor Museum, located at Dealey Plaza in Downtown Dallas. The Sixth Floor Museum examined the life, times, death, and legacy of President John F. Kennedy. I really enjoyed the museum’s depiction of John F. Kennedy, along with the countless photographs and memorabilia from the time of his presidency. Following the Sixth Floor Museum tour, the students ventured to the Spaghetti Warehouse for dinner. At the restaurant, we continued to talk about political and school related affairs, as well as who our favorite presidents were. Some students liked Abraham Lincoln, Theodore Roosevelt, and Calvin Coolidge, while I opted for Franklin D. Roosevelt. 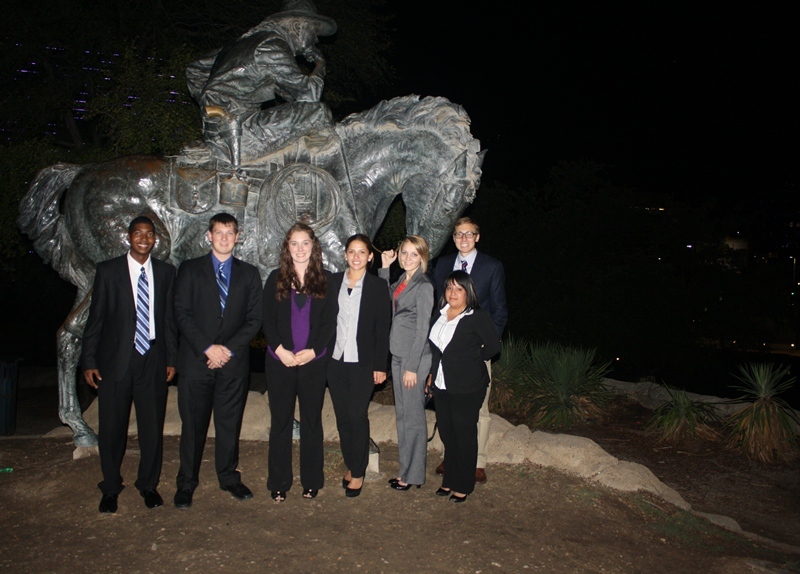 After dinner, the students embarked to the Dallas Museum of Art, which offered a special late night tour. 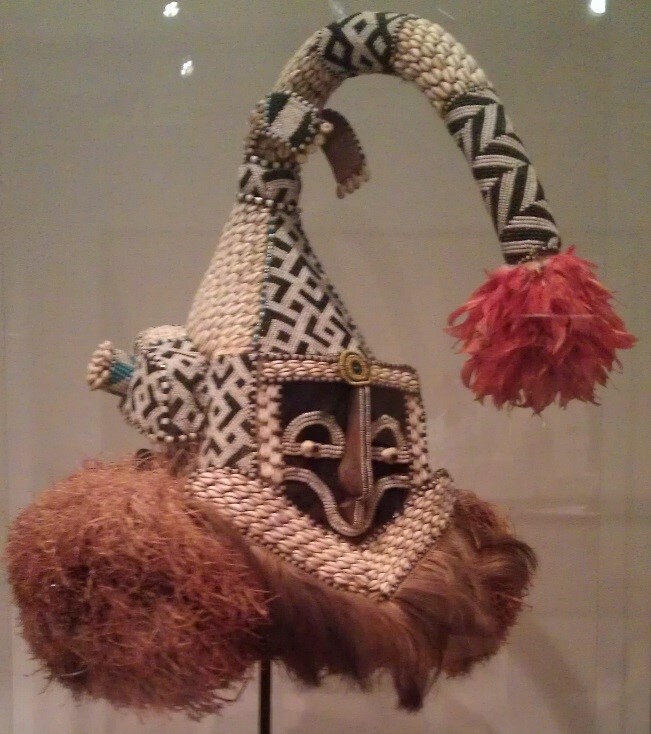 Throughout the Dallas Museum of Art, I admired the American Art, as well as the Egyptian Art. 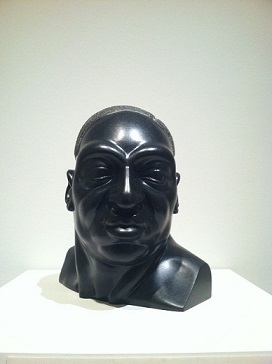 Leadbelly, by Michael Owen Jr., is an example of one of the sculptures I enjoyed, especially given the background of the sculpture only taking a month to create. I should also note that this piece has a connection to my adopted hometown of Huntsville, Texas, which features a mural of Leadbelly on a downtown storefront. 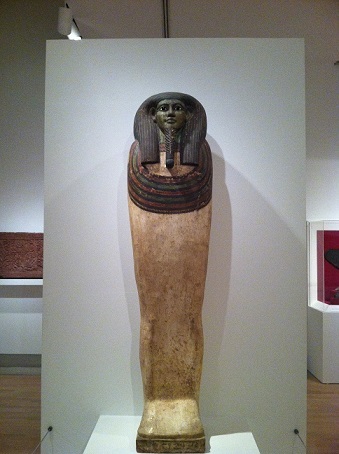 Coffin of Horankh, representing a coffin in the form of a human body, also caught my attention. This body of art was common within the Egyptian culture, as a means of “magically” assuring eternal life. Overall, I enjoyed the first day of the New Politics Event Forum trip, from the Chicken Caesar Salad at Woodbine Hotel / Restaurant to the aspect of engaging in different cultures at the Dallas Museum of Art. Finally, I look forward to sharing my experience from the New Politics Conference tomorrow at Southern Methodist University.